This beautiful setting is from the Verragio Paradiso Collection and features two princess cut side stones and pave diamond shoulders. 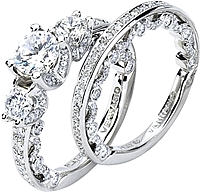 There is pave detail around the basket beneath the center stone of your choice enhancing its beauty. This ring has eight bezel set round brilliant diamonds and one bezel set princess diamond on the scalloped detail for a unique look.